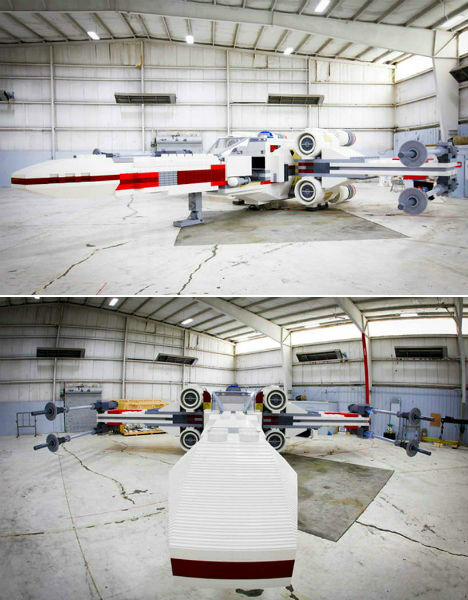 Forty-two times larger than the toy set currently available in stores, this Star Wars X-Wing Starfighter is made of over five million LEGO bricks weighing a whopping 45,000 pounds. Assembled in the LEGO model shop in Kladno, Czech Republic, the model is 43 feet long and 11 feet high with a wing span of 44 feet. 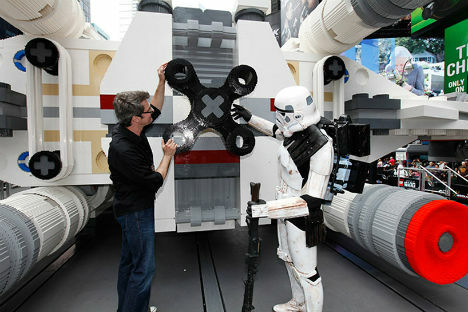 It was unveiled in New York City’s Times Square on May 23rd, and will be on display for Memorial Day weekend before reaching its final destination at Legoland in California. The model had to be carefully engineered with a steel framework system in order to withstand all of the travel, breakdown and re-assembly required to transport it across the Atlantic Ocean and from one side of America to the next. 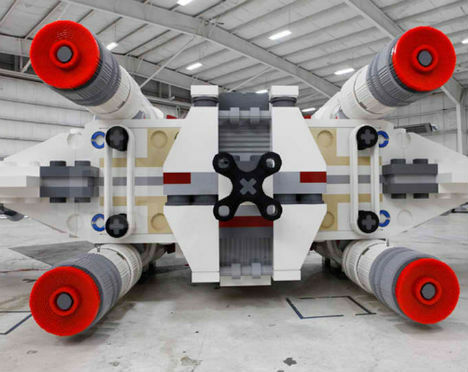 It took an international team of designers, builders, engineers, mechanics and logistics experts over a year to devise the plan that brought the massive model from concept sketches to reality. The time it took to construct the model, which is made using the same LEGO bricks sold at retail, was 17,336 hours, or about four months. The model can seat multiple fans in the cockpit for photo opportunities, and its four rear engines light up to a glowing neon red. 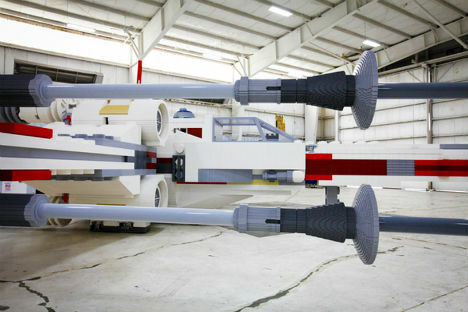 “We thought it would be a great idea to say ‘What if you took this, scaled it up to the size of what a real X-wing looks like, and here’s the end result,'” LEGO Master Builder Erik Varszegi told MTV Geek.